This article is part of a series on qosfc.com profiling Dumfries born ex Scotland full internationalists. Related articles as part of that series are Billy Houliston, Barry Nicholson, Bobby Ancell and Willie McNaught. One player who has been something of an enigma to football fans not just around the Dumfries area but probably across much of Scotland, is Dumfries born ex internationalist, Dominic Matteo. 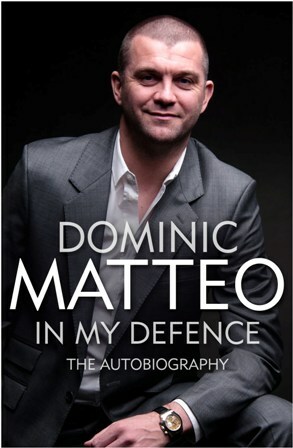 Now retired as a player, Matteo has brought out his autobiography titled, “In My Defence”. To coincide with this week’s international fixture date, this is a review of what Matteo has gone into publication with. Dominic Matteo was born in Dumfries on 28th April, 1974, the son of an English mother and Scottish father (while not detailed in Matteo’s book, a separate press article reports that in 1904 the Matteo brothers emigrated from the village of Vale Cupa in between Rome and Naples to Shettleston in Glasgow. This was two generations above Dominic). The family home in Dumfries was less than a 10 minute stroll from the main stand at Palmerston Park, namely at Babbington Gardens near Lochfield Road. Indeed there is a photograph in the book of young Matteo in the family garden at the residence where he lived as a Doonhamer for the first 4 and a ½ years of his life. 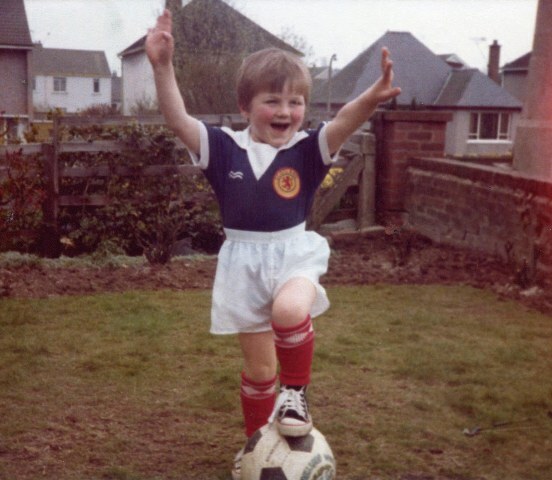 As seems to have been the case throughout his childhood, Matteo is wearing a Scotland strip. Dominic Matteo’s first ever experience of attending a professional football match was at Palmerston. The sides were Queen of the South and Celtic, the team supported by Glaswegian Alberto (Dominic’s father). Father and son entered Palmerston in the period in the second half when the gates were opened allowing free entry. Dumfries Dom was bought a Queen of the South strip soon after by his parents. Matteo states in his book that throughout his childhood he was insistent on wearing his Scotland gear at any possible time. This is supported by the various snaps of Matteo throughout his childhood where he also happens to be wearing the Scotland clobber of the day. When the Matteo family moved from Dumfries, Dominic suggests this must have been a tough decision for his family. He states that his earliest memories are with fondness and that the family had a good life in Dumfries. Matteo senior operated a successful fish and chip shop business in Dumfries (remembered to people of a certain generation around Dumfries as Matthew’s Café located in Friars Vennel). What the book also tells us is that Alberto additionally had stakes in a cake shop and in a sweet shop. Dominic says of this in relation to his father, “It wasn’t for him”. The reason given for the difficult decision to move when all seemed rosy for the Matteos, is that Alberto felt the opportunities would be better. It would be absurd to suggest Alberto had some psychic power correctly predicting the Dumfries bypass centrifugally gravitating business away from Dumfries town centre. There has been an increasing proliferation of boarded up shops and a now somewhat quieter feel of what was once a busier town centre hustle and bustle. Indeed Friars Vennel in which Matthew’s Café was once sited is a perfect example. In contrast, the urban fringe near the Dumfries bypass continues to prosper. Alberto gave up his career in café work and instead in Southport had numerous other jobs such as Bus Driver. The book comments the opportunities for schooling would be better down South. Matteo’s probable secondary school in Dumfries given his Italian ancestry would have been St Joseph’s College, founded by Brother Walfrid who 13 years later founded Alberto Matteo’s beloved Celtic F.C. Allan McNish, Sir Frank Williams and Baron Forte are among St Joe’s most notable alumni not to mention Colin McMenamin as an example of an ex pupil to have played for QoS. Some clarification from the author on the book’s comment re schools would be interesting to allow a reasoned scrutiny and analysis. Matteo played boys football for Birkdale United. Ironically, also at the club was Paul Dalglish, son of Matteo’s hero. From being spotted by Kenny, Matteo was in a group of young players invited to spend time at the Anfield club. Matteo was around the age of 10 beginning a 16 year association he had with the club (ex QoS goalkeeper, Reuben Bennett doesn’t get a mention despite the apparent overlap with the latter years of Bennett’s time on the Anfield coaching staff). It was also at this point that Matteo forged what has become a lifelong friendship with Robbie Fowler. After progressing through the ranks, Matteo signed a senior contract at the end of the 1991/92 season. His first team debut was in a friendly against a League of Ireland XI followed shortly after by his competitive debut, a league game against Manchester City at Maine Road. Matteo went on to play 155 first team games for the Anfield side scoring two goals officially. Matteo however claims it should be three with one goal being an on-target shot of his taking a deflection off West Ham’s Alvin Martin before ending up in the net. This was chalked up incorrectly as an own goal. Matteo comes across as a pretty grounded sort of guy, no mean feat on his part with the literally millions of pounds thrown at himself as a footballer in England’s Premier League and also with the accompanying fan adulation (especially in Matteo’s case from the time he spent at Leeds). He’s realistic enough to know that despite being a pro footballer having the degree of competence on the ball required to be a footballer of that standard, he never sees himself as a pseudo Diego Maradona. Matteo lists his greatest his strength as his attitude – the team is always more important than the individual and on the pitch he would give every ounce and make any sacrifice for the team. There are things that he looks back on though and now questions the wisdom. These things began at Liverpool. From early on in his career Matteo in his enthusiasm to play, did so after taking a cortisone injection to mask the pain of whatever injury he had at the time. This became something of a life style for Matteo, seeds from which he has now reaped a worrying harvest. The second has some relation to the first, namely alcohol. Matteo infinitely prefers the company of others to solitude and seems to have never turned down a social opportunity in his life. Huge swathes of his career read as an endless booze up after booze up, punctuated with a game of football every few days. Earning the nickname at Anfield of, ‘Hollow legs’, some read as boozathons of Olympic standard, thundering on for days. He asks the question of how well he would have performed had his body not been on the pitch with such limited recovery time from a boozing session? Also, how better would have his body have dealt with recovery from his catalogue of injuries had he optimised his physiology with some alcoholic abstention? And of course with the adrenalin rush from playing in packed stadiums now behind him, what does the future hold for him in light of what he has put his body through? Sobering info on this to follow. Matteo was known in Scotland in his playing days as a guy who had played for England below senior level who then played for Scotland. Throughout his book he states consistently that playing for Scotland had always been his ambition internationally. It is with dismay that he speaks of never having been contacted by anyone involved in the Scottish set up in his younger days, despite his Dumfries birth clearly documented in all the year books and the like. Matteo asked staff at Anfield if there had been any contact in relation to him representing Scotland - the answer was a straight, “No”. With Mick Oliver (ex QoS player of course), now assigned to microscopically scrutinise Scottish internationalist player potential from both a performance and availability context, Matteo’s experience now seems unthinkable. With disillusion, he thus got involved with the England set up not because of any great desire to play for England, but because it was his only international offer. He played for England under 21s in the Toulon tournament, something he speaks of as among his happiest days in football. A 10 day South of France boozefest with a bunch of other lads of his same age and with a few games at a football tournament chucked in? Matteo was in his element, made all the sweeter for him by his playing in the run to the final and lifting the trophy. Under Glenn Hoddle, Matteo was then selected for the England senior squad. He marked his arrival for his first squad by turning up blootered with his Liverpool team mates after a bevy down the motorway. It was while on England duty in February ’97 watching a game from the stand that he was introduced to Scotland manager, Craig Brown. Matteo then tried to take some action, still qualifying to play for Scotland through having never played for the senior England team in a competitive fixture. On returning to Anfield (asking Brown directly while on England duty he felt would have been disrespectful), he asked manager, Roy Evans, to let the Scotland set up know that he still wanted to play for them. He heard nothing in return for two years before his name was being mentioned in the press prior to Scotland playing a friendly in Dublin in May 2000. However Matteo’s leg was in plaster at the time so still nothing substantial materialised. Things changed though six months later when before a friendly against Australia in November, Craig Brown contacted Matteo to say he wanted to play him against the Aussies. Matteo was overjoyed to say, “Yes”. Looking at it clinically, Matteo’s selection had considerable potential. Scotland had qualified for four of the five major tournament finals in the 90s, easily their best decade of qualification. In reality though, the standard of player in the squad had been in something of a decline since the earlier part of the decade. There had been a time when the Scotland squad was packed with players with experience of playing in the latter stages of UEFA organised club competitions. Indeed it had generally been the Scottish players who had been in the nucleus of the most important players at their clubs in England (as well as in Scotland as would be more obvious to expect). By now though, Scottish players playing in European club semis and finals were an exception. Matteo for his part already had one European semi final on his CV with another soon to follow. His positional versatility and natural left sidedness could have much to offer. As he had done with England, Matteo marked his arrival in the Scotland set up by getting bevvied. Carrying an injury, his appearance was in doubt but cleared up sufficiently to allow him to play. Scotland at the time were in the middle of a long, long run or poor form in home friendlies, something that lasted beyond the Brown reign. Vogts, Burns, Smith, McLeish and Burley; all endured a poor showing in home friendlies, something finally redressed by Craig Levein. The Aussies won 2-0 with Matteo stating he had a poor game. Brown defended him in pubic, again appreciated by Matteo. Matteo still states though that lining up for his debut and singing Flower of Scotland at Hampden is among his proudest memories in football. The pantomime around Matteo’s representation was not yet over. Sven-Goran Eriksson was now England manager and aware Matteo could still play for his side. Eriksson contacted Matteo to tell him he wanted him as a left footed player to balance his central defence. Eriksson laboured the point of Matteo as someone with a left foot who could play at centre back, stressing Matteo faced little competition for that position. Despite the prospect of playing alongside his central defensive partner from Leeds, Rio Ferdinand, Matteo wasn’t tempted. Matteo always considered himself more Scottish than English, describing himself as gutted while supporting Scotland when Gary McAllister missed his penalty against England at Euro ’96. Again it was Scotland Matteo supported when the two sides met in November ’99 in a two legged play off for a Euro 2000 spot. His heart said Scotland and he has no regrets, even when retrospectively appreciating that playing for England could have been a better career move with England reaching tournament finals Scotland did not. His next Scotland game was a key fixture, a World Cup qualifier against Belgium at Hampden. All seemed to be going well for the Scots thanks to two Billy Dodds goals and the Belgies with a man sent off. The Scots failed to finish them off and the Belgians pulled it back, equalising in the last minute. Matteo feels this was the best game he played for Scotland, a synopsis that seems very fair. A constant threat bombing up and down the left hand side, there was also his defensive contribution. Both Belgium goals came from crosses into the middle from wide positions. Neither goal came from Matteo’s wing. Matteo looks back on the evening after the game as among the worst of his career, describing the equaliser as “devastating”. Matteo played three other qualifiers; a 4-0 home win over San Marino, a 0-0 home draw against Croatia, and in the deciding game in Brussels where Belgium won comfortably 2-0. His next appearance was in the debut appearance of new manager, Berti Vogts. Reigning World and European Champions, France, thrashed a poor Scotland side 5-0. This was to be Matteo’s last international appearance. With the benefit of 20/20 hindsight of Berti Vogts` reign, Matteo’s international retirement could be wondered of as foresight of the chaos to follow. Matteo however speaks only respectfully of Vogts and gives no mention of him in his reason for international retirement. With his increasing injury problems, Matteo was sent to Munich to see Bayern Munich club doctor, Dr Hans Mueller-Wolfhart. The outcome of four days of tests, scans and treatments (radiation therapy included), was a dark picture. Matteo was taking as many as three cortisone injections (pre game, post warm up and half time) to get through a match. He felt forced to sacrifice international football to try to prolong his professional career. Once again though, Matteo hadn’t heard the last of his international saga. When at the JK02 World Cup Finals to support best mate Robbie Fowler, Matteo was given stick by England fans for having played for Scotland. By the time of his Scotland call up Matteo’s days at Liverpool had ended. After three seasons as a squad player Matteo had spent four seasons with his name a regular feature on the team sheet. As well as Fowler, the others in this era were Steve McManaman and then Michael Owen, Steven Gerrard and Jamie Carragher all breaking through to the first team. Another team mate was a player described as loved by his team mates for being, “Thick beyond words”, Jason McAteer. Matteo’s move was when Gerard Houllier had taken over the reigns. Unhappy with the booze culture that persisted among the playing staff, the Frenchman accepted an offer from elsewhere as he sought to bring in a significantly more sober set of players. In the early ‘90s Manchester United had replaced Liverpool as England’s team to beat. Thus the high water mark of Matteo’s Liverpool career was arguably the Cup Winners’ Cup semi final appearance against Paris St Germain in April ’97. Matteo’s new side were a team riding high, on the field at least, Leeds United. With chairman, Peter Ridsdale, throwing money around like no tomorrow, David O’Leary built what seemed a highly financed and highly capable side. From Matteo’s signing on 16th August 2000, it was over a month (injury again) before his first team debut. As debuts go though, it couldn’t get much better - a 1-0 win at home against Milan in the Champions League. It is against Milan in which was the iconic moment of his career, certainly to Leeds fans. The Yorkshire club had done well in their group. Matteo himself scored in the 6-0 home walloping of Besiktas. Then came a couple of draws (Besiktas away 0-0, Barcelona at home, 1-1). Matteo had missed the opening game 4-0 defeat in Barcelona. Results in the group meant a final game draw in Milan would see Leeds through. Getting himself first to a Lee Bowyer corner, Matteo’s header inside the near post put Leeds ahead. The Italians equalised and a 1-1 draw saw both sides qualify. Leeds fans still sing their Matteo San Siro song to this day. The second group stage brought further big name opposition, Real Madrid, Lazio and Anderlecht. Again Leeds went through, progressing with the Madrid side of Figo and Raul. More Spanish opposition followed, eliminating Deportivo La Coruña 3-2 before a semi final exit to Valencia with all goals coming in a 3-0 defeat in Spain. Matteo became club captain after the sale of Rio Ferdinand to Manchester United. Captaincy is a distinction at any club, but Matteo’s time in Yorkshire ended in circumstances of some controversy. The club imploded after racking up enormous debts. Making Rangers fiscal policies of recent years seem positively frugal, Peter Ridsdale and his board borrowed £60m against future gate receipts, based on the blue sky budgeting of persistent Champions League qualification. Leeds achieved the feat only once, the season in which Matteo scored in Milan. At a press conference signalling the start of the Leeds fire sale, Ridsdale justified his financial planning with four words – “We lived the dream”. It was no dream for Matteo and the others still at the club. As club captain Matteo was requested to ask the playing staff to accept a 40% pay deferral for two months to the season’s end. With the club’s future in the balance and having earned more cash than he had dreamed possible, Matteo said to his team mates that he was prepared to accept the deferral. No one else in the room agreed with him (at that moment, a few did privately afterwards), and Matteo was hit with a tsunami of abuse. The club were relegated at the end of Matteo’s fourth season at Elland Road. His ex manager at Liverpool, Graeme Souness, made an offer for Matteo to go to Blackburn Rovers. Matteo accepted unaware Arsene Wenger wanted to take him to Arsenal. While no longer having the responsibility of captaincy, Matteo took on a new role – social convener. Despite preferring others to take the social spotlight, he felt fully qualified. Matteo played in a third club semi final when at Rovers. Again he lost, this time 3-0 to Arsenal at the Millennium Stadium with Rovers missing out on a first FA Cup Final appearance since the Ally MacLeod side of 1960. Added to his cup appearances Matteo played 28 league games in his first season at Ewood. That was as good as it got for him there. In his second season he played the first five league games before injury took effect again. When recovered, Matteo rarely got near the first team playing only two further games that season for Souness’ replacement, Mark Hughes. It got worse. The season after he was told to train with the youth team. Despite asking why, he wasn’t given a straight answer. With having played only the two first team games in 15 months, Matteo asked for a move in the January transfer window. His career playing top flight football was over. Tony Pullis came in with a loan offer from Stoke City where Matteo impressed sufficiently to be offered a 12 month contract at the season’s end. His apparent value to his new manager was highlighted further when Stoke became the second club he captained. Matteo’s second season at Stoke was the one where they were promoted to the top tier. Matteo though spent much of it on the side lines. He played as a regular starter up until completing the game against Jamie McAllister’s Bristol City on October 27th. He then didn’t play again (you’ve guessed why), until a 0-0 draw at Burnley on 24 November 2007. Matteo states this as turning out to be the last game of his career at the age of 33. It was indeed his last start and his last league game but soccerbase lists Matteo as playing as a 75th minute sub for a largely second string Stoke side in a League Cup 3-2 win away at Cheltenham (26th August 2008, the evening of Queen of the South playing in Denmark in the UEFA Cup). We took this up with soccerbase for whom the very helpful Chris Mann has provided numerous sources (e.g. match report in the Daily Telegraph), confirming Matteo played in that tie. Matteo had been playing with one of his boots a size and half too big to accommodate the swelling during the game. After the Burnley game the swelling was of zeppelin dimensions, attracting team mate comments that it was time to give up. Matteo wanted to continue. Seeking medical consultancy, x-rays revealed what he already knew, he had been playing with two broken bones in his foot with pain killing cortisone injections. He elected to have the broken bones removed and set about rehab looking to win a contract for the season after. At the season’s end an offer was forthcoming - to join the coaching staff. What reads as the biggest concern for Matteo now appears not to be his troublesome foot. Nor does it seem the still problematic knee, one of the two areas for which he had treatment in Munich. The other area of attention in Munich was Matteo’s back. In late 2010 Matteo had an operation to replace 2 discs in his spine with artificial ones instead. The other four discs in his lower spine are also damaged but have been realigned with the intention of trying to avoid the more serious resort of disc replacement. Matteo is recovering and hopes to progress in coaching work after having been briefly involved in this at Stoke. Matteo does media work and also owns a bar. As a post script to the original publication of this article, Bruce Wright, ex QoS Programme Editor has given us the anecdote that he remembers Alberto Matteo when he lived in Dumfries playing amateur football for a side named The Red Romans. As the name suggests a number of the players had at least some Italian ancestry in their background. Bruce also comments that the last time he seen Big Alberto at Palmerston was when Alberto was in his days as a Southport Bus Driver.